Figure 1: Geostrophic currents computed from sea level anomalies overlaid on sea surface salinity in November 2015 and 2016. The southward East Indian Coastal Current is stronger in 2016, carrying the River plume further south than in 2015. Figure 2: Geostrophic currents computed from sea level anomalies overlaid on sea surface salinity in September 2015 and 2016. 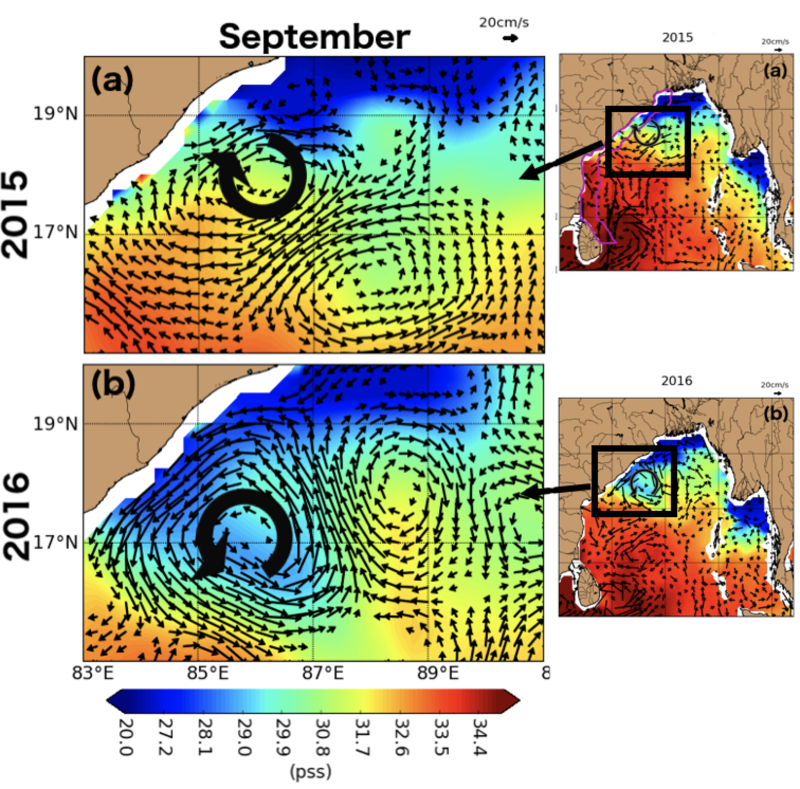 A cyclonic eddy around 18°N carries the freshwater plume further south along the coast in September 2016 than in September 2015, when an anticyclonic eddy prevents the transport. The Ganga-Brahmaputra River, located north of the Bay of Bengal, accounts for two thirds of the total river discharge within the Bay, mostly at wet monsoon time (Summer). This massive input of freshwater has consequences on biology, on mixing and on tropical cyclones within the Bay, the freshest sea in the tropics. 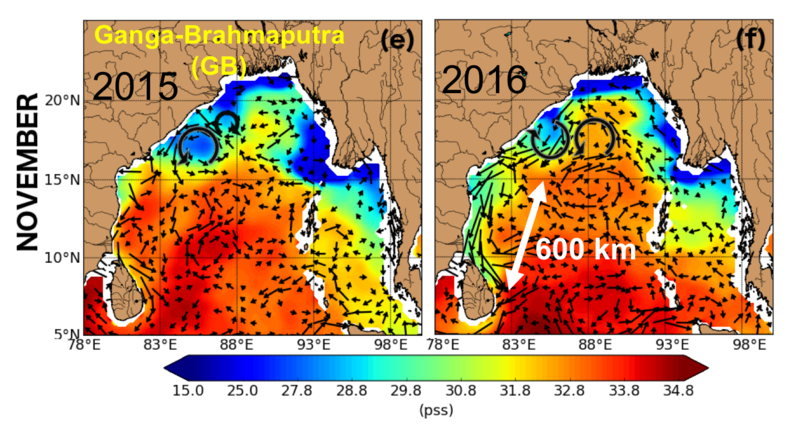 The extension of the Ganga-Brahmaputra river plume within the Bay of Bengal is controlled by the Indian Ocean Dipole (IOD), a coupled ocean-atmosphere process, and ocean dynamics (such as eddies), but not by river forcing. The negative Indian Ocean Dipole in the Fall of 2016 caused a stronger East Indian Coastal Current (EICC) and as a result, the river plume extended approximately 600 km further south than in 2015 (Figures 1 and 2). Eddies induced meandering of this plume, keeping freshwater close to the coast (Figure 3). 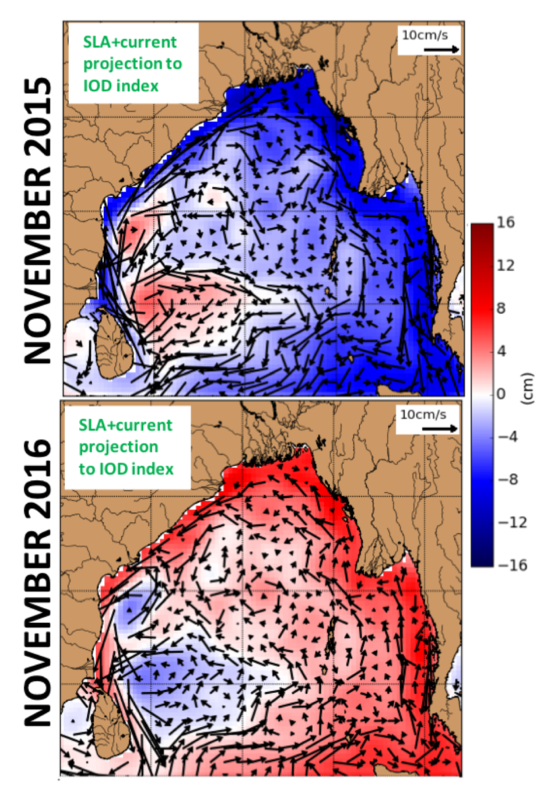 Figure 3: Sea Level Anomalies (SLA) and geostrophic currents anomalies associated with the Indian Ocean Dipole in November 2015 and 2016. 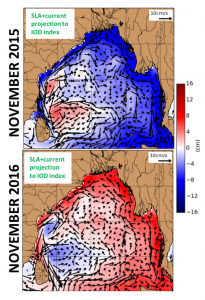 The positive (negative) Indian Ocean Dipole in the fall of 2015 (2016) caused a negative (positive) SLA along the rim of the Bay and strong northward (southward) East Indian Coastal Current anomalies causing an anomalously weak (strong) southward East Indian Coastal Current and freshwater transport. 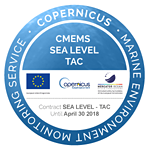 Both the freshwater plume and the ocean circulation are monitored from space – the freshwater by salinity/soil moisture satellites, the latest launched being SMAP, the circulation by altimetry, using DUACS multimission sea level anomalies and derived geostrophic currents. The two independent measurements are in very good agreement, and complement each other to better understand this region and its specific features.